Training for multiple opponents is a very important part of Atienza Kali. Atienza Kali Tuhons believe that real combat involves more than one opponent and weapons. The progression in Atienza Kali is designed for the AKP to aquire high levels of skill for combat. Atienza Kali Tuhons understand the chaos of life and death combat and strive to be able to function at a high level in that chaos, calmly. This is called “Slick in the Chaos” among practitioners. Mass attack training begins early in Atienza Kali. It is introduced during one-on-one training, as all of the rules of engagement that are taught during one-on-one training are directly transferable to mass attack training. The Atienza Stalker Exercise introduces the AKP to the dynamics of multiple opponents. While the practitioner is practicing a particular technique or techniques, the instructor inserts a second or third opponent into the training. These extra opponents, called Stalkers, transform what was previously a one-on-one drill into a Stalker Exercise. The Stalker Exercise helps the AKP learn the fundamentals of fighting more than a single opponent, such as Body Shielding and Combat Peripheral Stare. The Stalker Exercise can be applied to all the Atienza Kali training components. Once the stalker exercise is trained the next step is the Atienza Mass Attack Exercise (AMAX). The AKP is put into various attack scenarios where they have to apply Atienza Kali Mass Attack strategies. The other side of the multiple opponent issue is how to most effectively use numbers during a violent encounter. While superior numbers are an advantage, groups of people who fight as individuals, rather than as parts of a whole, can become confused, indecisive, scattered, and may unwittingly work against each other. 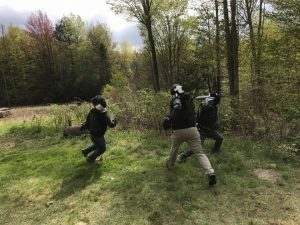 Combatants who are most successful during violent encounters have learned, whether through trial and error or training, how to work as a team. 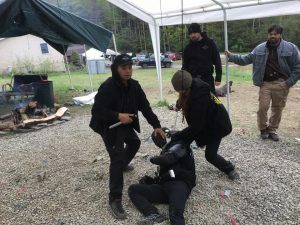 Atienza Kali Wolfpack Tactics builds upon an AKP’s fundamental training and teaches the Practitioner to fight and move in mutual support of a teammate. 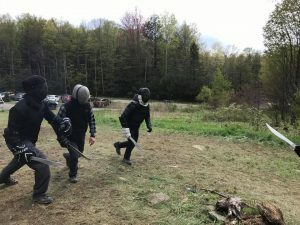 To even begin to work together as effectively as possible, a practitioner will need to have a solid grasp of distance, footwork, fighter types, and the minute timing involved within the fighter types that will be employed in any given encounter. Added to these fundamentals are the many lessons in verbal/non-verbal communication. Like all aspects of Atienza Kali training, Atienza Wolfpack Tactics curriculum can be very challenging, but rewarding.